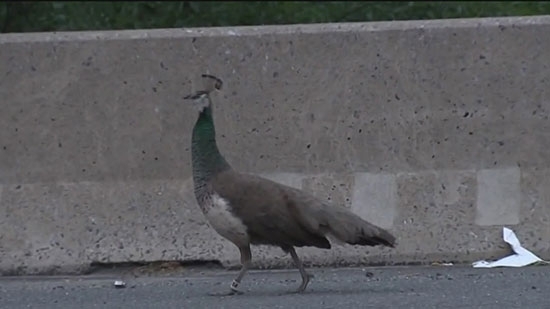 One of four peacocks that escaped from the Philadelphia Zoo on Wednesday evening, 5/30, has been found dead. Zoo officials say the bird most likely was hit by a car. The flock roams freely on the grounds of the zoo and sometimes wanders away but always comes back. Last night around 8:30 p.m., the four birds had made their way onto the Schuylkill Expressway I-76 causing a traffic jam. State police were able to corral them before they jumped off the roadway and into the woods. The three others are still on the loose. Teams from the zoo were on the lookout. "They circled the area where the peacocks were last seen and checked locations where these animal teams believed the peacocks might explore," the zoo said in a statement. If you spot the birds, keep your distance and contact authorities. Philadelphia Police have released surveillance video of suspects wanted in a double shooting this week that injured a 7-year-old girl and 23-year-old man. It happened on Tuesday, 5/29, at 8:43 p.m. on the 3500 block of Emerald near Tioga Street in the Harrowgate neighborhood. Four suspects jumped out of a maroon and silver van and began firing shots. 7-year-old Shakayla Brown was hit in her upper left shoulder. Her mother drove her to St. Christopher’s Hospital. She is expected to recover. A 23-year-old man was also shot in the arm. He was taken to a nearby hospital in stable condition. The four suspects got back in the vehicle and drove off. Anyone with any information is asked to call police at 215-686-TIPS. A school in North Philadelphia was placed on lockdown today for a gun scare. It happened just before 10 a.m. at Tanner Duckrey School, located at 1501 Diamond Street. A mother had called the school and told them that her gun was missing and that her eighth grade son may have taken it. He was already on suspension for a different incident but police were concerned he might come to school anyway with the weapon. The K-9 searched and found that a completely unrelated student had a B.B. gun in his backpack. That student was taken into police custody and was being questioned. The lockdown was lifted after about an hour. Meanwhile, at around 11:45 a.m. Temple University police stopped two young males nearby the public school in connection with the lockdown. No word on if that includes the boy originally sought.